As Affirma’s Visual Design Practice Lead, my area of blogging focus will be real-world design dilemmas, and talking through our process for solving them. This week it’s going to be very real-world. We’re talking about The Wall. The Wall. Affirma has been working to customize and “spruce up” our office space, since it started out as what can be described as “1992 Cubicle Farm”. Being the techy, sci-fi lovers that we are, we like grids, lines and squares. 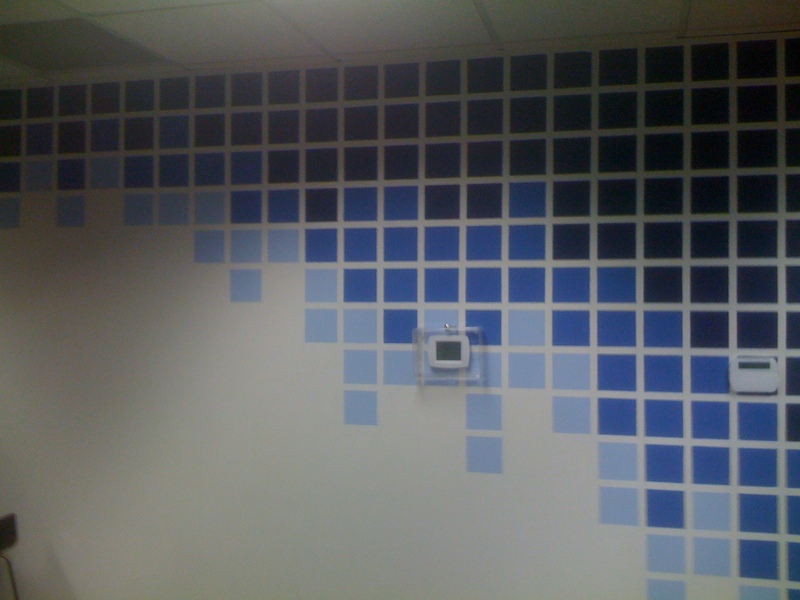 Ultimately a design student friend of the team came up with a very cool grid design utilizing three shades of blue. Affirma’s logo has a dark navy blue color that was used as the inspiration for the darkest starting color. The two remaining colors are a medium and a lighter shade of the same blue. Design side note here – using varying shades or even sheens of the same color can give a simple yet sophisticated design look. I’ve used this technique with painting floor to ceiling stripes or diamond shapes with great success. The same color will look darker with a high gloss versus flat or even an eggshell gloss. Give it a try, it’s only paint. 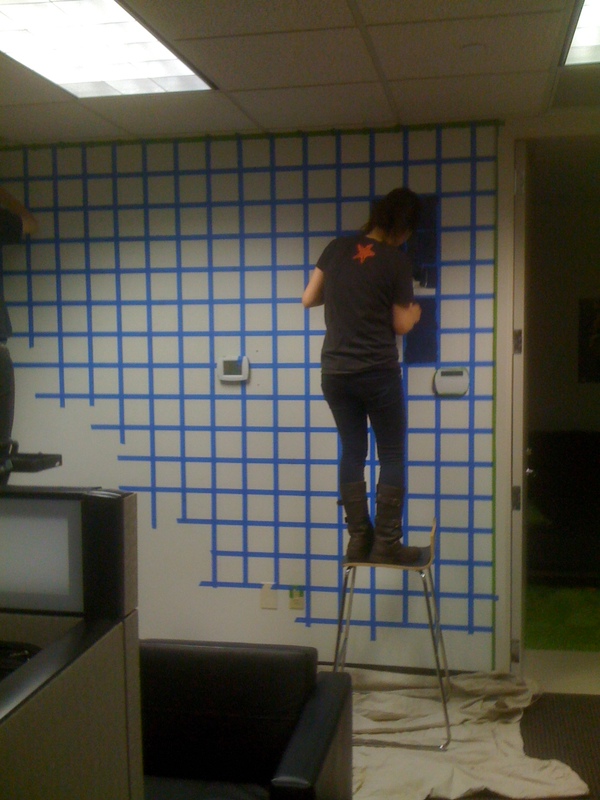 So that was a geat start to the newly updated wall – colors and a design we all agreed on. Most of the battle is behind us and all that’s left is implementation. Sounds easy, straight lines and squares of the same size on a large scale. It turns out that laying out and masking a couple hundred squares on a wall – and getting them straight, level, and symmetric – is more challenging than doing the same thing in PhotoShop. Yeah, right? But with two attempts, a good ruler, a 6 foot level and lots of determination we had straight lines and sound squares up and ready for paint. In the next few days we completed painting the wall and everyday I walk past it, I smile because as a team, we took the time to make it right. This pretty much sums up how we do everything at Affirma. If you see an issue and you can fix it, step up, offer your support and make it right. Here’s a couple of in-progress photos and the final result, much better in person of course.